NEOGEN Bio Peel Gauze Green Tea uses patented 3 layer cotton gauze pads to create a manual exfoliation combined with the chemical peeling effects of Glycolic Acid to dissolve dead skin cells. These pads are also soaked in Green Tea Serum and Tea Tree Oil to make your skin smoother, softer and moisturised. Suited for all skin types, especially sensitive / red skin, oily and acne prone skin. If you purchase this product you will earn 35 Points! These exfoliating pads will effectively remove excess oil, dirt and dead skin cells on the surface of your skin and in your pores using Glycolic Acid. Green Tea Serum and Tea Tree Oil help to heal acne, reduce redness and soothe inflammations. Centella Asiatica Extract keeps your skin barrier strong in addition to repairing damaged skin. 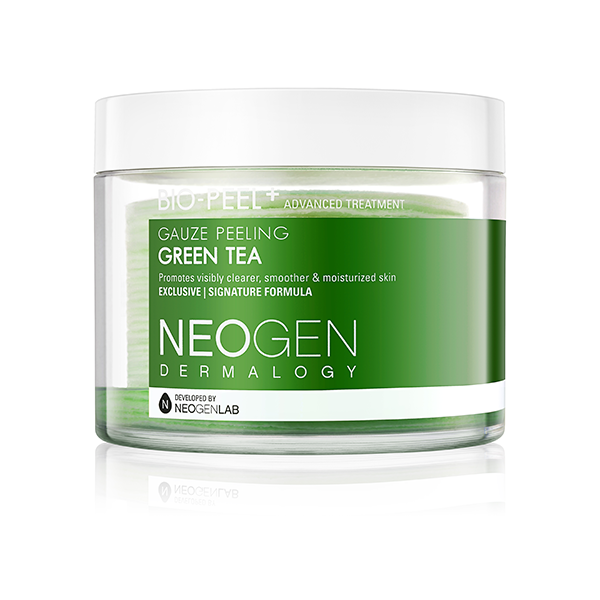 Using Neogen Bio Peel Gauze Green Tea regularly will make your skin being clearer, calmer and refreshed. Glycolic Acid (AHA) – a natural AHA derived from sugar cane. This acid effectively exfoliates dead skin cells that, if left on your face, lead to uneven skin tone and light pigmentation. It is also water soluble, therefore providing moisture to the skin. Green Tea – contains healing and antibacterial properties that heal blemishes, inflammations, scars and acne. Centella Asiatica Extract – a plant ingredient that regenerates skin cells, heals and soothes acne and reduces redness. Tea Tree Oil – an ingredient with antibacterial properties that reduces swelling and soothes inflammations. Tea Tree also draws out excess oil, calms acne and disinfects inside your pores. Discover more of our NEOGEN range here. 1. After cleansing, take one exfoliating pad and slip 2-3 fingers into the pocket on the pad. 2. Use the gauze (criss-cross) side first, gently exfoliating in circular motions from the neck up to the forehead. Apply more pressure if if desired. 3. Turn the pad over and use the soft side to sweep off remaining debris. 4. Rinse with lukewarm water. 5. Follow with your daily toning. LFI Tip: Recommended use – twice a week. If you are using any other exfoliant in your routine, including AHA/BHA chemical exfoliators, use the Neogen Bio Peel once a week. Neogen; “Modern, Sophisticated and Progressive. Your Beauty Innovator.” This popular Korean beauty brand uses the latest derma-ceutical research and innovations to create solutions for every skin care need. Neogen skin care products help the individual customise their skincare regimen to suit their own preferences as well as specific skin concerns.